March was another month of mixed results for consumer confidence. The Consumer Confidence Index increased after a falling in February. The Consumer Sentiment Index fell after increasing in February. According to the Conference Board the Consumer Confidence Index jumped 4.0 points on a month-over-month seasonally adjusted basis in to 82.3. The rebound from February was attributed to improved expectations for economic conditions in the short-term. Consumers were more upbeat about jobs and the overall economy conditions, but remain less optimistic about income growth. Income growth remains a challenge for the housing industry moving forward, especially for first-time home buyers. According to Thomson Reuters and the University of Michigan, the Consumer Sentiment Index fell in March by 1.6 points from the prior month. The drop was attributed to softening of the long-term economic outlook by consumers. According to the Conference Board, the share of consumers planning to buy a home in the next 6 months was 5.5% on a seasonally adjusted 3-month moving average basis. The share of respondents planning to purchase a “lived-in” home was 3.4% on a seasonally adjusted 3-month moving average basis. The share of respondents planning to purchase a new home was 1.3% on a seasonally adjusted 3-month moving average basis. All measures were down from the prior month, but an improvement over one year ago. An unusually cold winter may have attributed to another month of mixed result in measures of consumer confidence. 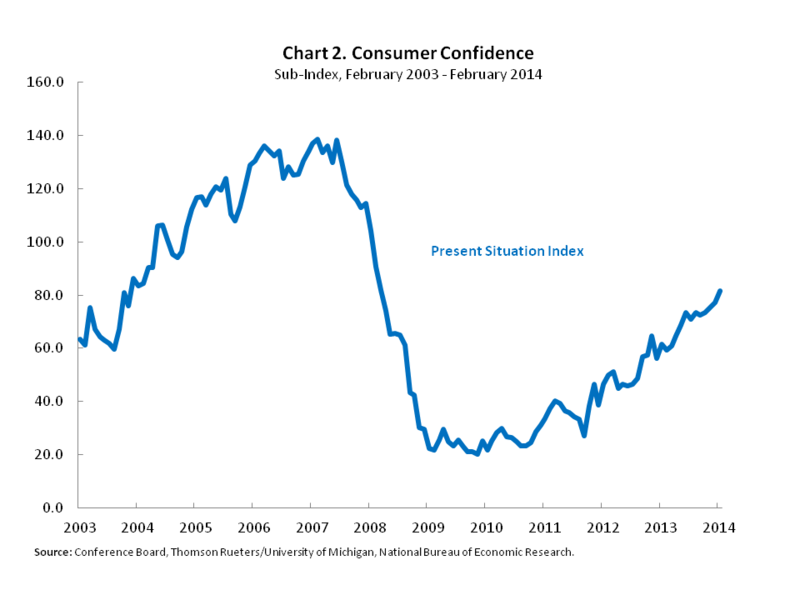 However, unanswered questions remain about consumer confidence as it pertains to the housing market. In the upcoming year, interest rates and income growth will play an important role not only in the housing sector but also in the broader economic recovery. February was a month of mixed results for consumer confidence as the Consumer Sentiment Index increased while the Consumer Confidence Index decreased slightly. After a slide in late 2013, both measures have shown resilience in the face of extreme weather and high utility bills. According to Thomson Reuters and the University of Michigan, the Consumer Sentiment Index increased in February by 0.4 points from the prior month. Meanwhile after increasing in January, the Conference Board reported that the Consumer Confidence Index fell by 1.3 points on a month-over-month seasonally adjusted basis in to 78.1. The month-over-month decline in the Consumer Confidence Index was attributed to concern over the short-term economic outlook. In spite of this concern, the Present Situation Index is at its highest level since April 2008. The Present Situation Index is a sub-index of the survey in which participants are asked about current economic conditions. According to the Conference Board, the share of consumers planning to buy a home in the next 6 months was 5.9% on a seasonally adjusted 3-month moving average basis. 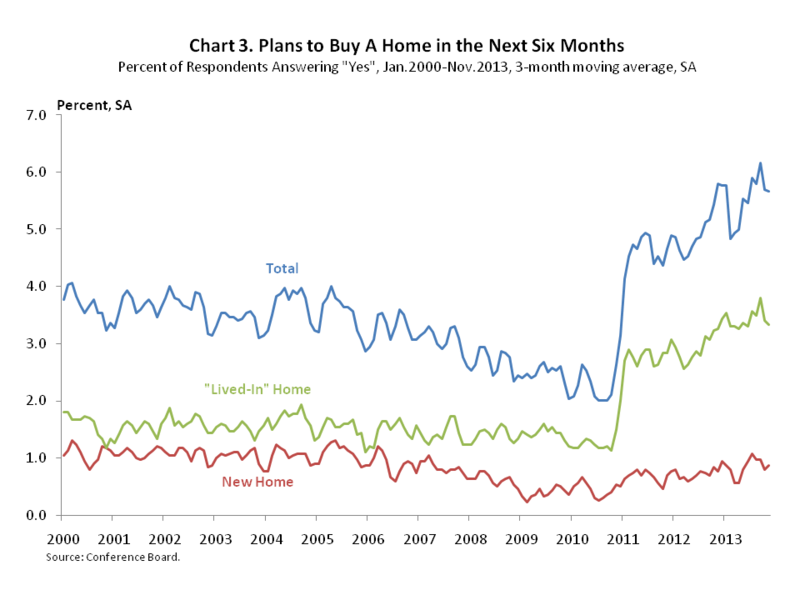 Over this same period, the share of respondents planning to purchase a “lived-in” home increased slightly to 3.4%. 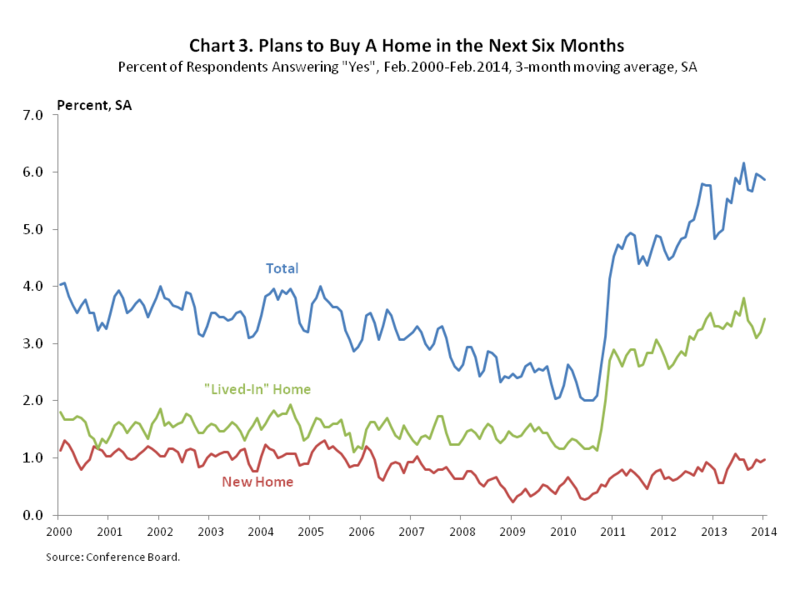 The share of respondents planning to purchase a new home was 1.0%. 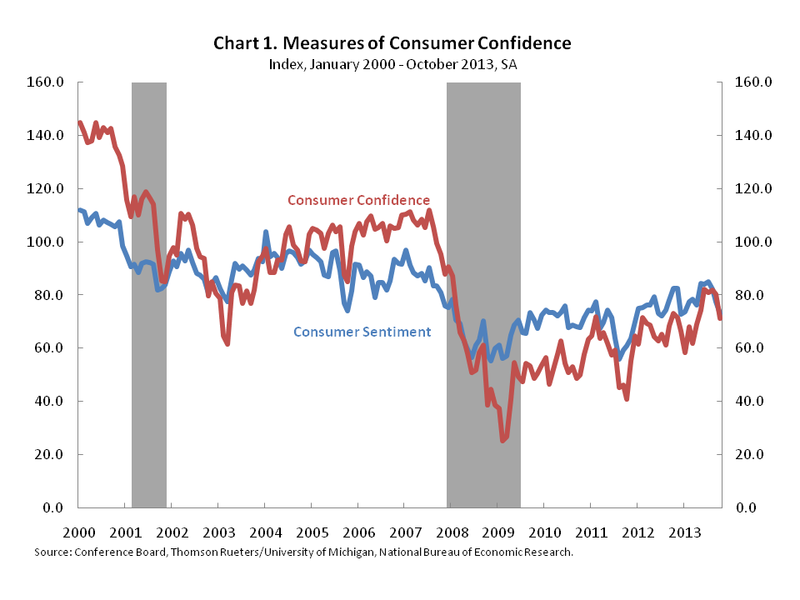 The mixed result in measures of consumer confidence does not provide clarity to the broader economic outlook. Instead, questions remain on strength of the labor market and lagging income growth for younger age groups. 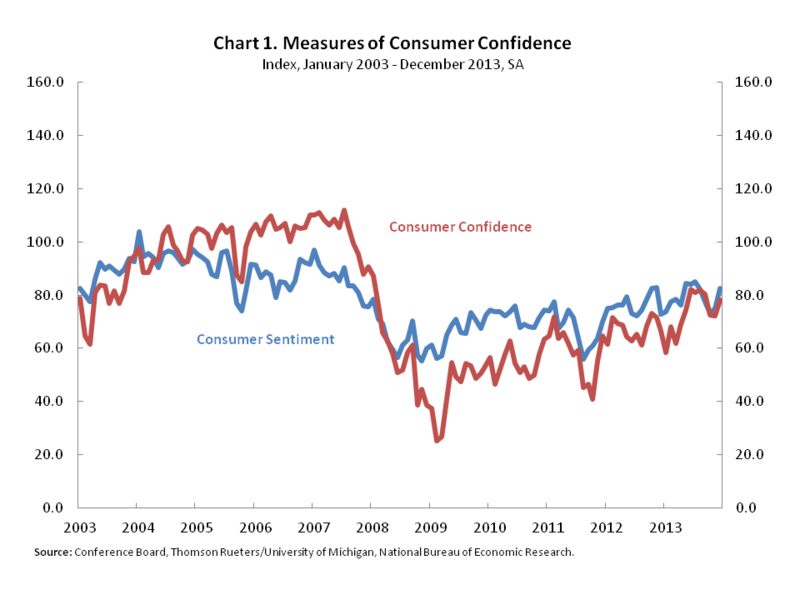 Measures of consumer confidence improved in December reversing course from the recent decline. The Conference Board reported that the Consumer Confidence Index increased by 6.1 points on a month-over-month seasonally adjusted basis in December to 78.1. Meanwhile, according to Thomson Reuters and the University of Michigan, the Consumer Sentiment Index rose by 7.4 points in December. In addition to current economic conditions, the Conference Board surveys consumers’ future expectations. 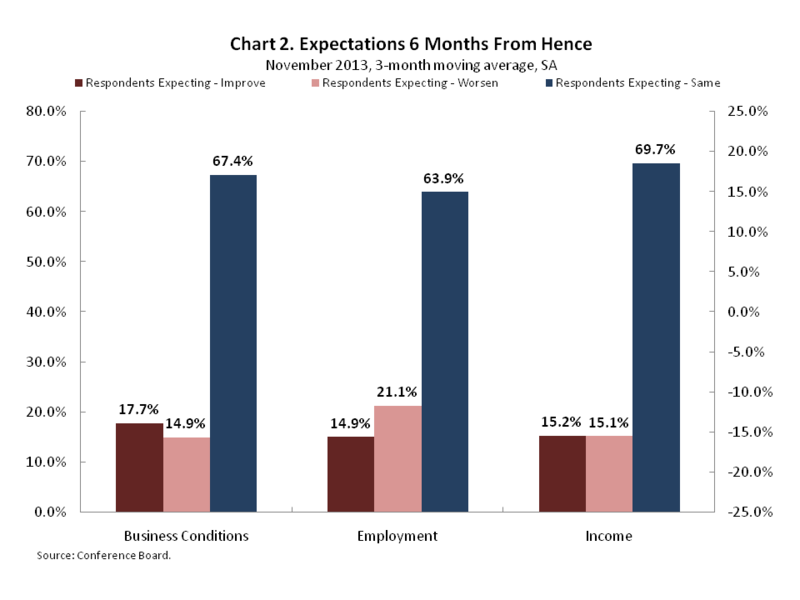 Consumers are asked whether they expect economic conditions in 6 months to improve, worsen, or stay the same. 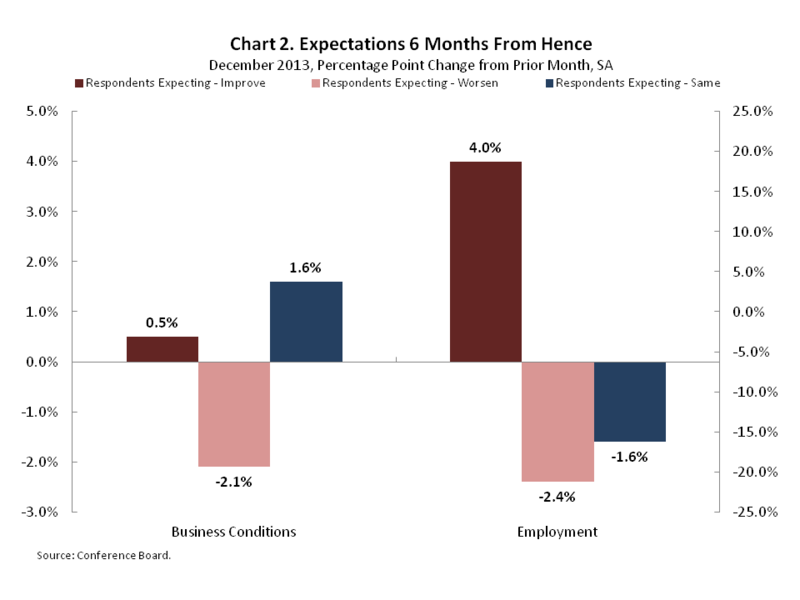 Consumes’ expectations for business conditions improved in December. The respondents expecting business conditions to improve increased by 0.5 percentage points while the respondents expecting business conditions to worsen decreased by 2.1 percentage points. 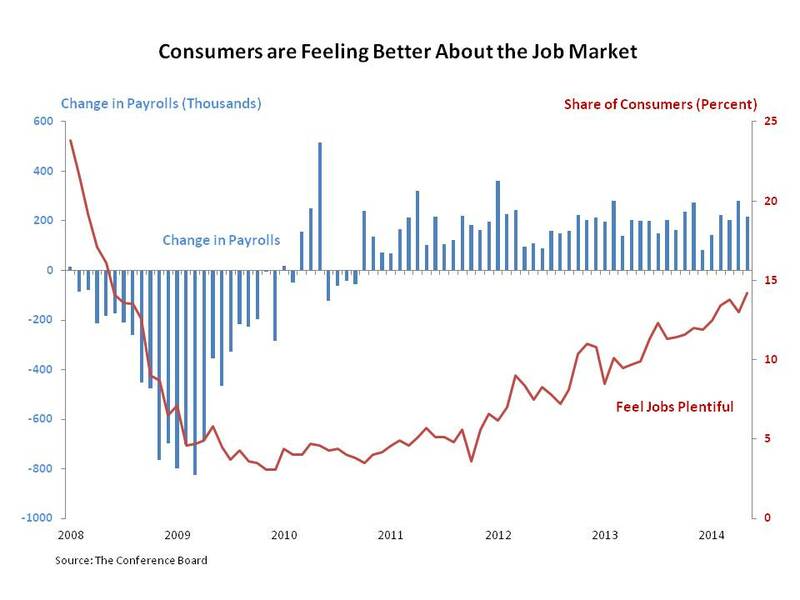 Consumers’ expectations for the labor market were considerably more optimistic in December. The respondents expecting labor market conditions to improve increased by 4 percentage points while the respondents expecting labor market conditions to worsen decreased by 2.4 percentage points. According to the Conference Board, the share of consumers planning to buy a home in the next 6 months was 5.8% on a seasonally adjusted 3-month moving average basis. 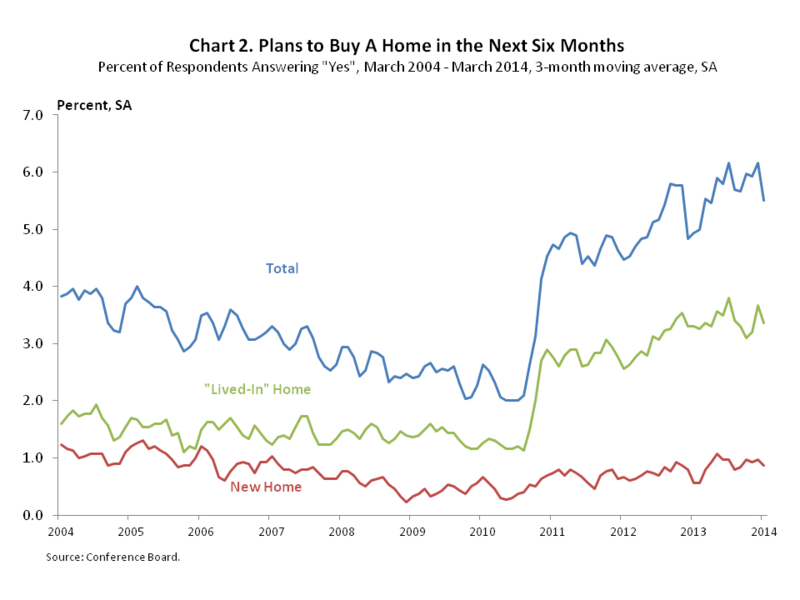 Over this same period, the share of respondents planning to purchase a “lived-in” home decreased slightly to 3.0%. 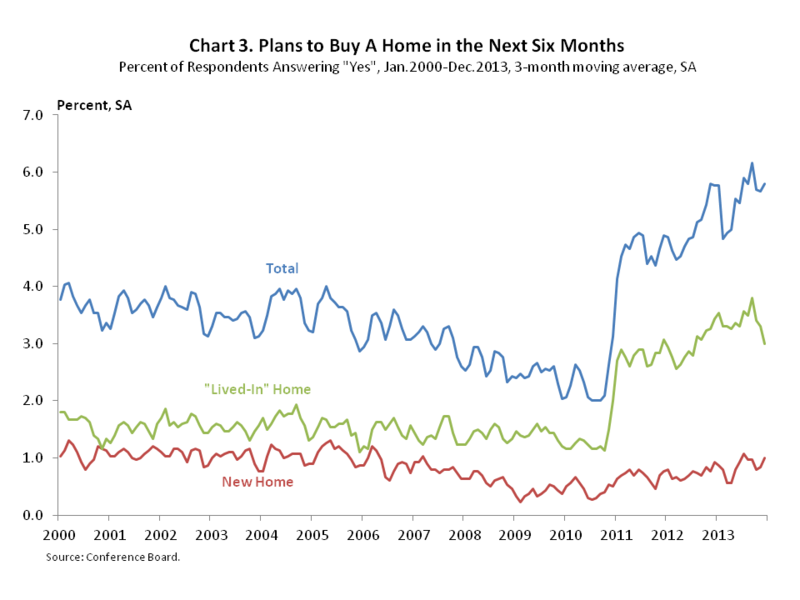 The share of respondents planning to purchase a new home increased to 1.0%. 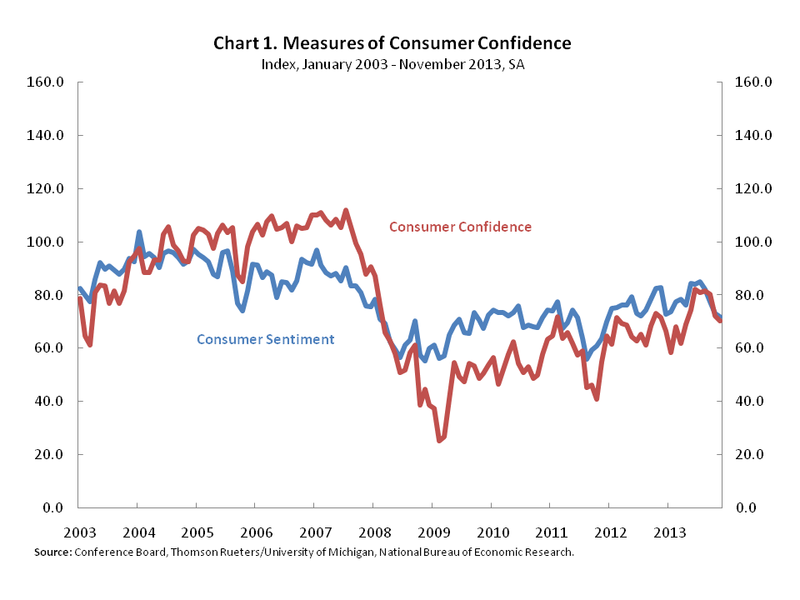 The December rebound in measures of consumer confidence was a welcome result. The recovery appears to be back on track; however, questions still remain about the strength of the labor market and the effect on mortgage interest rates from the recent decision of the Federal Open Market Committee (FOMC) to wind down its asset purchase program. These questions will be answered in 2014. Measures of consumer confidence continued to slide in November falling for the third straight month. The Conference Board reported that the Consumer Confidence Index fell by 2 points on a month-over-month seasonally adjusted basis in October to 70.4. Meanwhile, according to Thomson Reuters and the University of Michigan, the Consumer Sentiment Index fell by 1.2 points in November. Although the rate of decline slowed in November, the question is whether the readings show a softening economy or a short-term reaction to the government shut-down. In addition to current economic conditions, the Conference Board surveys consumers’ future expectations. Consumers are asked whether they expect economic conditions in 6 months to improve, worsen, or stay the same. Although the overwhelming majority of consumers expect conditions to stay the same, more respondents expect business conditions to improve at 17.7% than worsen at 14.9%. Fewer respondents expect employment conditions to improve at 14.9% than worsen at 21.1%. The share of respondents expecting income to increase was nearly identical to the share expecting income to decrease at just above 15%. According to the Conference Board, the share of consumers planning to buy a home in the next 6 months was 5.7% on a seasonally adjusted 3-month moving average basis. 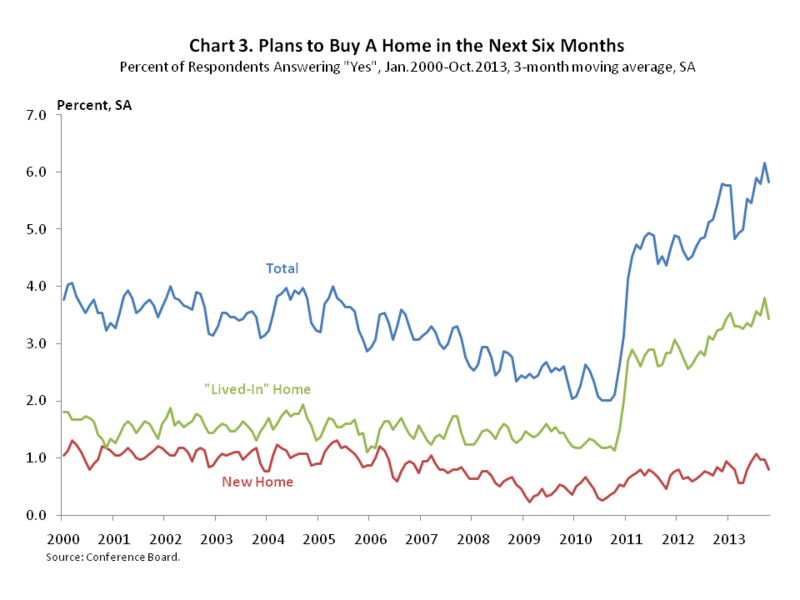 Over this same period, the share of respondents planning to purchase a “lived-in” home decreased slightly to 3.3%. The share of respondents planning to purchase a new home increased slightly to 0.9%. The housing market has been bolstered by low interest rates and tight housing supply, however three straight months of declining consumer confidence are concerning. 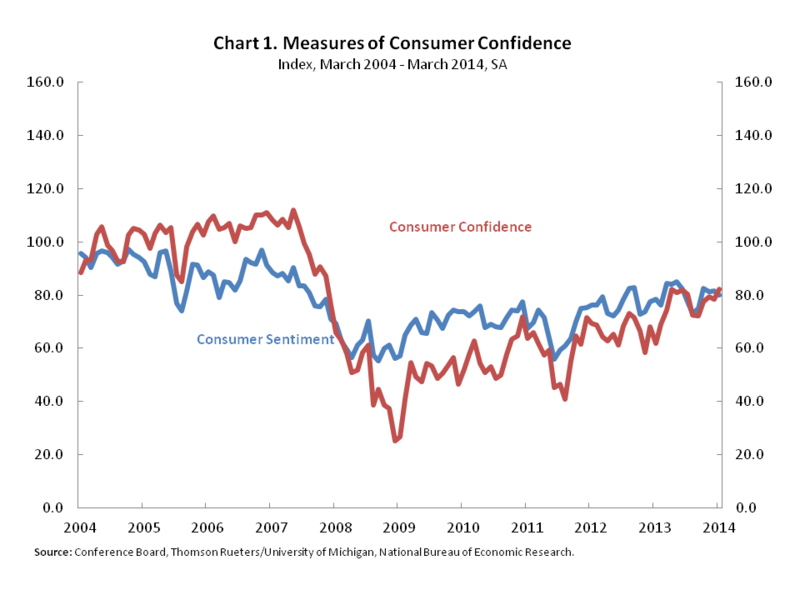 Consumer spending during the Holiday season should provide us with a better understanding of the nature of the recent decline in consumer confidence. Measures of consumer confidence fell for the second straight month in October. According to Thomson Reuters and the University of Michigan, the Consumer Sentiment Index fell in October to 73.2 the lowest reading since December 2012. The Conference Board reported that the Consumer Confidence Index fell sharply by 9 points, 11.2%, on a month-over-month seasonally adjusted basis in October to 71.2. Consumer confidence was shaken largely by the partial government shutdown and debt-ceiling crisis. 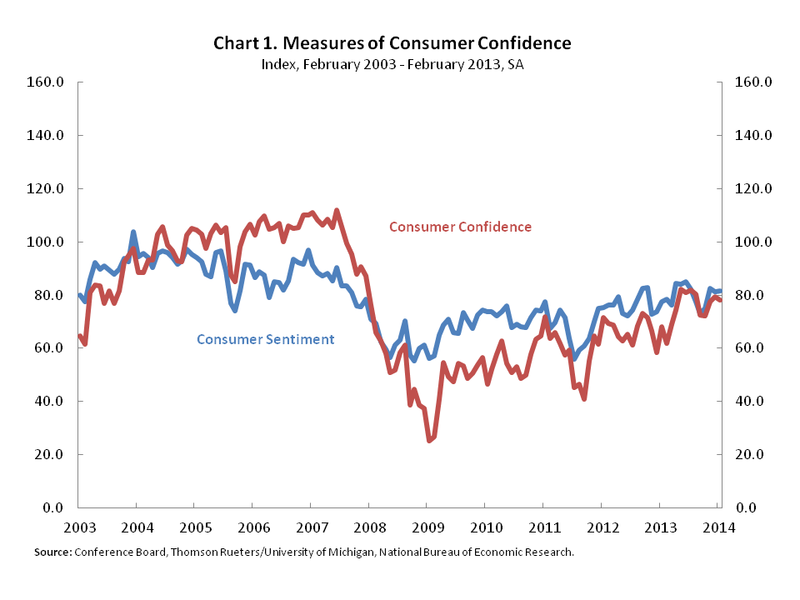 Although a stopgap measure was signed, consumer confidence is likely to be volatile in the upcoming months as Congress revisits the budget and debt-ceiling. In spite increasing consumer pessimism on business and labor market conditions, the housing market has been bolstered by low interest rates. However, the majority of consumers believe interest rates will increase. 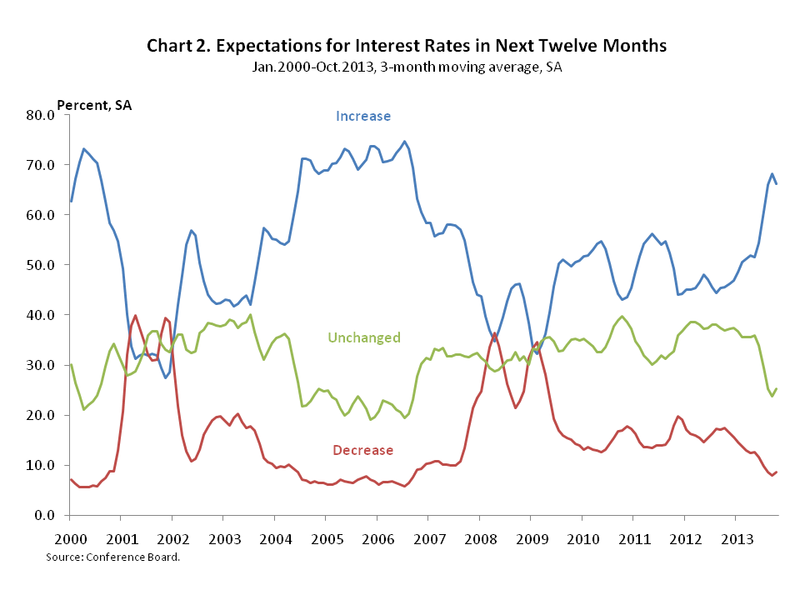 According to the Conference Board the share of respondents expecting higher interest rates in the next 12 months was 66.2% on a seasonally adjusted 3-month moving average basis. Rising interest rates and policy uncertainty may also be negatively affecting homebuyer expectations. According to the Conference Board, the share of consumers planning to buy a home in the next 6 months was 5.8% on a seasonally adjusted 3-month moving average basis. Over this same period, the share of respondents planning to purchase a “lived-in” home was 3.4% while the share of respondents planning to purchase a new home was 0.8%. These measures were all down from the prior month.